Mix the strawberries and the sugar together in a bowl, then let them stand for 20-30 minutes. Stir every so often and the fruit will soften up and become syrupy. Pour the strawberries into a food processor or blender, then add the lemon juice and pulse until the fruit is pureed. 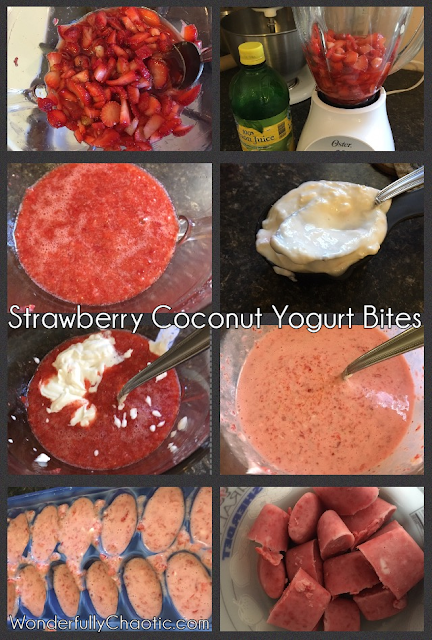 Pour strawberries back into the bowl and stir the yogurt in until combined well. Pour into Popsicle molds and freeze overnight. We didn't have Popsicle molds so I just used ice cube trays and they worked great. To make it easier to get them out, run some hot water over the outside of the tray and then push.